Think you know everything about airplane propellers? Think again. Here are eleven things you probably didn’t know about the props that power us through the skies. Neil Armstrong placed a piece of the left airplane propeller of the original 1903 Wright Flyer on the moon. The largest airplane propeller ever used in flight was 22 feet, 6 inches in diameter, made for the German-made Linke-Hofmann R II in 1919. The fastest propeller-driven aircraft – according to the Guinness Book of World Records – is the Soviet Tu-95/142 long-range bomber, with a maximum speed of Mach 0.82. Its four engines drive eight-blade contra-rotating airplane propellers. 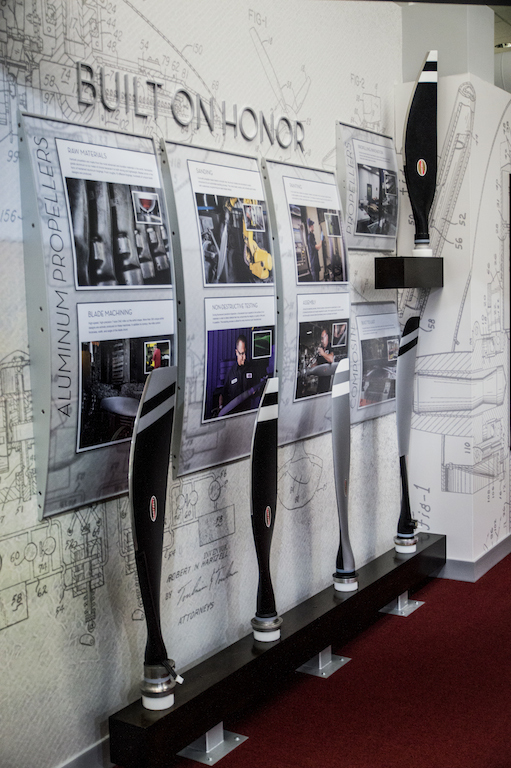 Hartzell Propeller got its start in 1917, when Orville Wright suggested to Robert N. Hartzell of Piqua, Ohio that he use his family’s walnut trees and lumber mill to manufacture airplane propellers. The largest turbo-propeller driven aircraft is the Antonov An-22 Antei, a heavy Russian military transport aircraft, which was first unveiled to international audiences in 1965. 799,972 airplane propellers were created to power the flight of all of the aircraft used in World War II from 1940-1945. The original 1903Wright Flyer had a 12-horsepower engine that drove two pusher airplane propellers of the brothers’ own design. Diameter and RPM are the biggest variables that affect propeller thrust – as those go up, so does thrust. To prevent the action of airplane-mounted machine guns from interfering with the operation of the airplane propellers, an interrupter was created, which synched the actions of the airplane propeller and the machine gun. In 2015, as part of an experimental aircraft test, NASA mounted 18 airplane propellers powered by lithium iron phosphate batteries onto a 31-foot wide carbon composite wing.